Standing in front of a painting with its creator can be awkward at the best of times. But standing in front of The Sunbather in Newcastle Art Gallery with Michael Zavros, I’m lost for words. Actually, I’m not. I just don’t think it would be appropriate to say, “nice bum”. Through what they paint, artists have the ability to reveal some inner truth about the human condition. With The Sunbather, Michael Zavros has revealed his bottom. The painting shows Zavros lying naked by a pool, and he is staring at his own reflection. The Sunbather references art history, from David Hockney to Caravaggio, but ultimately your eyes are drawn not to the past but to that buff and tanned body. “I think I made it for those reasons, I can talk about Hockney, and about narcissism and role play and those sorts of things,” muses the artist. “But then I just think, ‘Wow, that’s a very audacious thing to do’. In the flesh, Michael Zavros is not audacious. The 42-year-old is considered, picking his words as carefully as he applies paint to his hyper-realist pictures of beauty. Yet Zavros has a reputation for audacity, at least in his public life. For an exhibition at the Melbourne Art Fair at the time of his 40th birthday, Zavros hired the Stenmark twins, who are male models, to hand out chocolates embossed with his monogram. He is often photographed at glamorous openings and awards nights. 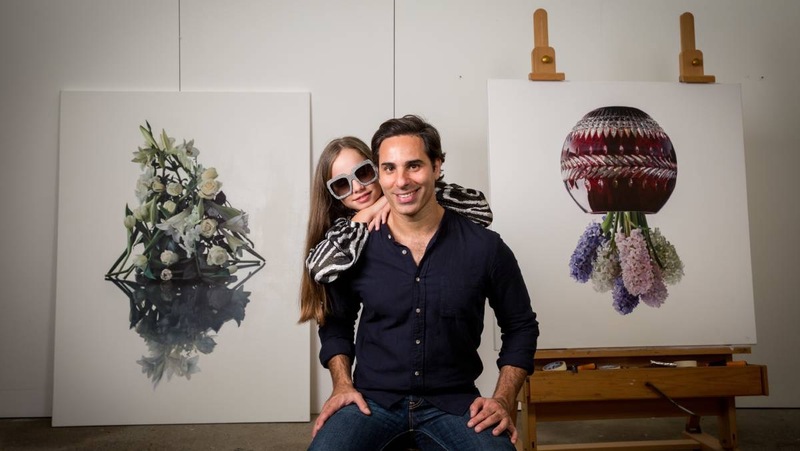 Zavros himself has won a swag of awards, including the Doug Moran National Portrait Prize, the richest of its type in the world. He is also keenly sought after for commissions, having painted portraits of former Governor-General Dame Quentin Bryce for the National Portrait Gallery and Victoria Cross recipient Ben Roberts-Smith for the Australian War Memorial. The public and the private, the performer and the painter, often collide on the canvas. His technique is applauded, but the paintings’ flashiness can blind the viewer to what’s going on under the surface, or the skin, of his images. In The Sunbather, Zavros is baring not just his body but his soul to explore vanity and self-obsession. “In some ways, this is as ancient as the Greeks, the idealised human body, but I think in the past few centuries that has become repressed and often seen in bad terms for us men. But I think that’s changed. Vanity, and the effort required to create and maintain beauty, is a focus of Zavros’ exhibition at Newcastle Art Gallery, which opens March 4. 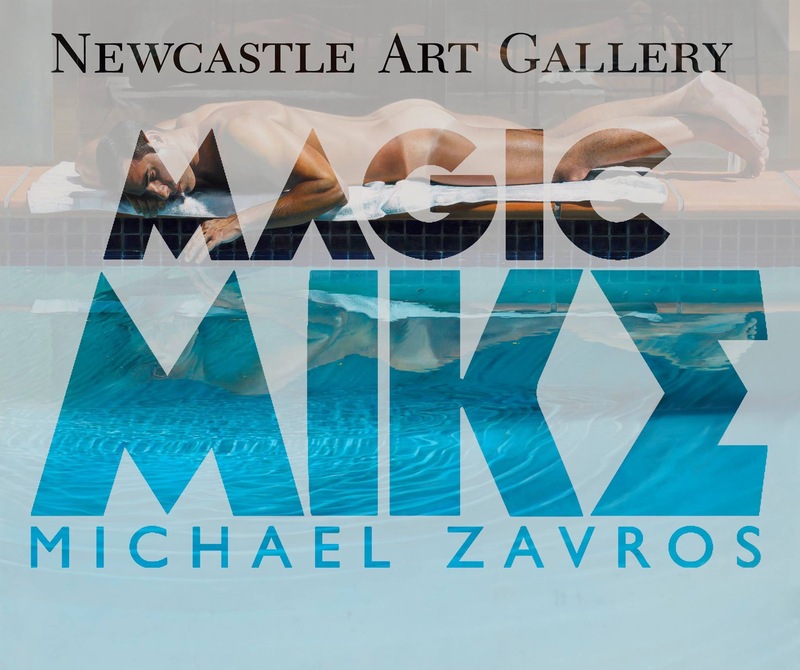 It’s titled Magic Mike, a cheeky reference to his own name, and to a Hollywood film about a troupe of male strippers, which, Zavros admits, he hasn’t watched all the way through. Lauretta Morton first raised the possibility of an exhibition with Zavros in 2015. She has known him since they worked together on a group exhibition at the gallery in 2004, Auto Fetish, looking at Newcastle’s car culture. More recently, she had negotiated with him to buy The Sunbather and another work, The Mermaid, for Newcastle’s collection. When Morton visited Zavros at his family home and studio in Brisbane last year, he suggested Magic Mike. And, to bring the paintings to life, he proposed setting up a gym in the gallery. “At first, I thought, ‘Are you mad?’,” laughs Morton. But the gym equipment is being installed, and a group of “well-structured male performers” will be working out in front of the paintings. Morton reckons the mingling of art and muscle will appeal to gallery goers. In painting youth, Zavros often depicts his 11-year-old daughter, Phoebe. She is the subject in the disconcertingly intense The Mermaid, in which she is floating in the pool that her father used for his self-portrait in The Sunbather. Given she is approaching her teenage years, and body image is a major issue for many adolescents, I ask how comfortable both he and Phoebe are about her being painted. Michael Zavros reckons to paint the subject of vanity, he only has to look in the mirror. “I’m definitely vain, but even that’s waning,” Zavros says. “As a parent, you just don’t get the chance to be self-focused, you don’t think about those things so much.